I've recently become a bit obsessed with looking at the urban fabric of different cities. I've looked at building footprints in English Cities, Scottish Cities, and collected data on a number of US cities, including San Francisco, New York, Chicago and Los Angeles. I've blogged and tweeted about this quite a bit over the past few months and the reason I'm so fascinated by it is that it provides some really interesting visual insights into the spatial structure of cities. I also find it fascinating to make visual comparisons between cities, as in my 'Urban Fabric of English Cities' blog post from October 2014. Now I'm going to look at Los Angeles. I've only been there once but I found it fascinating in so many ways (urban structure; fragmented political, social, racial geography; freeways; congestion; In-N-Out Burger...). Famously, Los Angeles is also the most populous of the 3,144 counties of the United States with a population of just over 10 million. 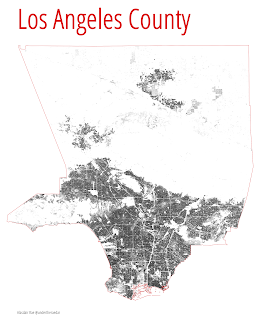 The first image below shows all 3,000,000 or so buildings in LA county - all 4,000 square miles of it (for comparison, London is 607 square miles). Anyone who knows anything about American cities will understand that the concept of a 'city' and a 'boundary' is not necessarily as straightforward as it might appear - well, at least not to me as a British person. 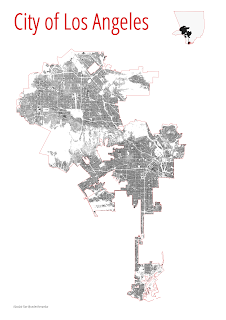 The City of Los Angeles is a rather odd shape and has a population of about 3.8 million. 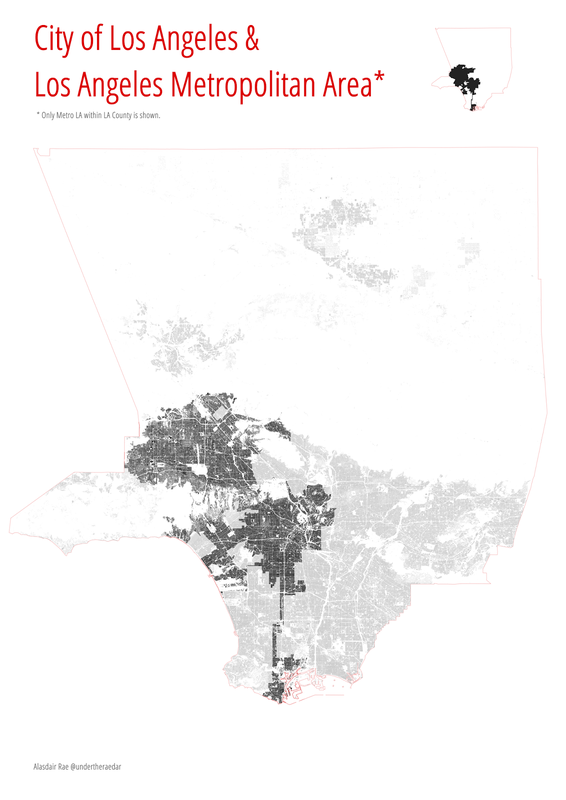 The image below shows the urban fabric (building footprints) for the City of Los Angeles. 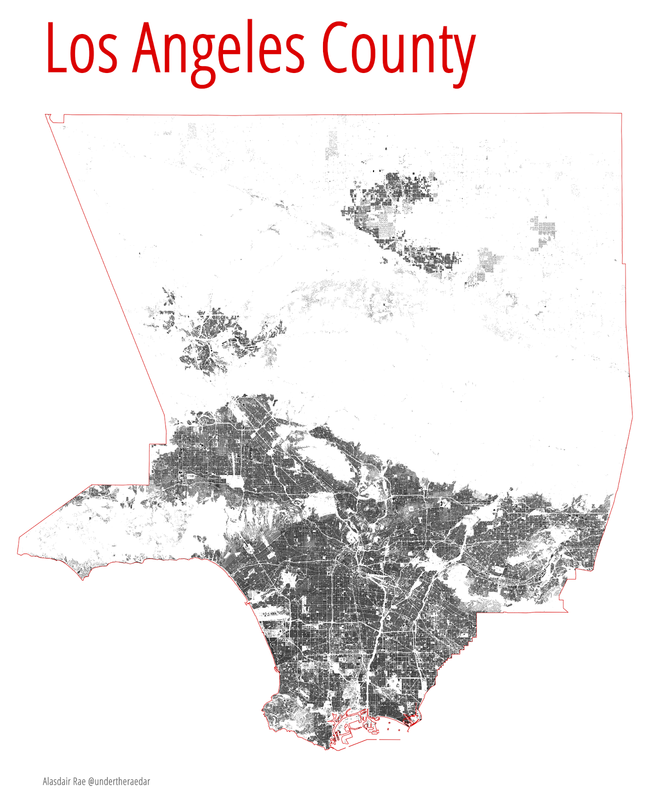 Finally, I've produced a map showing the wider Los Angeles metro area (within Los Angeles County), with the urban footprint of the City of Los Angeles highlighted. The wider metro area extends beyond the boundary of Los Angeles County and has about 13 million people. What's the point of all this? Partly a mapping experiment and partly to illustrate the idiosyncrasies of political and administrative boundaries in urban areas compared to the underlying urban fabric. This is very acutely demonstrated in the case of Los Angeles. If you like these images and want them in higher resolution versions just get in touch via twitter - @undertheraedar or e-mail. I've linked to a high res version for the LA city map.